Citation: C N Trueman "Peter the Great"
Peter the Great was born in 1672 and he died in 1725. 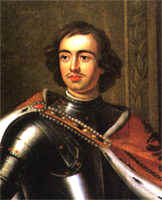 Peter was tsar of Russia from 1682 to 1725. His self-given title was Peter the Great though he was officially Peter I. Without doubt, Peter the Great’s childhood toughened his outlook on life and people. His life was constantly under threat from factions surrounding the two widows of his father. When his father, Alexis, died in January 1676, Peter’s elder brother succeeded as Theodore III. His succession was legal and no-one could dispute it. Theodore died in 1682.